The promise of contemporary technology lives in what these tools can do that previous learning and educational technologies could not -- they are open, connected, individualizable, and flexible. 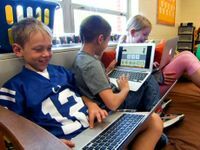 But if your school adopts these new technologies without adopting the policies and practices that take advantage of these differences, you have likely defeated your students before you've even begun. In the Albemarle County Public Schools, we've worked hard to choose the paths that allow all of our students the full benefit of their century's tools. When we give our grades 6-12 students a 1:1 computer to take home, those students are the local administrators of their devices. They can download software, change settings, rearrange icons and menus, and personalize with on-screen images and bookmarks, or with stickers. They can make the computer fully theirs. Why? Because these are lifetime skills that they must learn, and because a "personalized learning device" is not that if we (not they) control it. Do children mess up? In the words of Vince Scheivert, our CIO, "Of course they do, they're kids, and do middle school kids mess up more often? Of course they do, they're in middle school." But then he adds, "And we're OK with that." We quickly reimage the device and give it back to them. Our middle school kids mess up a lot, our high schools kids almost not at all. That's learning. We hand our students real laptops with real capabilities, and we fill them with software, apps, and bookmarks. We like to have at least three ways that kids can do anything. They can use Google Apps to write, or Microsoft Word, or Open Office Writer. We have four different ways to convert Text-into-Speech, a half dozen different calculators, all kinds of organizational tools. We want our children to discover how to choose effectively for their own needs. To do that, they need choices, and so we believe in Toolbelt Theory. Our laptops are Universal Design for Learning (UDL) devices -- they have the full Freedom Stick suite of accessibility tools installed. Microsoft Speech-to-Text is linked prominently on the start menu. We have talking calculators, Balabolka, and WordTalk installed into Microsoft Word. This is for every student. You don't need an IEP to choose these tools. No student will have mechanical limitations in access to either information or communication -- whether through disability, inability at this moment, or even just discomfort. Learning is our goal, and we make it accessible. Our school district, 726 square miles including hills, hollows, and mountains, comes with significant challenges. Seventy percent of this area lacks broadband access. Other areas lack access because of poverty. So with our Educational Broadband Spectrum -- something that the Federal government gave to every public school -- we're building out an LTE-4G system for home and on-the-go connectivity for every student in our district. This isn't easy, and we're doing it without any budget initiative, but it is essential. "All means All," says the sign in our superintendent’s office, and we take that seriously. Every child needs the same opportunities, and we can make this possible. Every school facility has both a "closed" (our devices) and "public" (any device) network. And with the exception of certain licensed resources, both go almost everywhere on the internet. Every K-12 student can use his or her own device in class. This is key to both UDL and choice. And teachers can collect old smartphones, reset them to operate as everything but phones, and use them in their technology tool crib. Parents can connect in school lobbies, libraries, or in the parking lot waiting for their kids. We see ourselves as a place where information is available and tool use is learned. How much screen time is too much? What about filters? Why is this important? As with faculty, we help parents understand that we live post-Gutenberg, and the ways of learning and communication have changed. Too much of anything is too much, our kids don't stare at screens all day in school, and we'd love them to be outside playing at home. But make sure that your children have as much unstructured play with friends offline/outside as they do online. We help parents consider filtering their home internet service, or shutting down WiFi at night, or simply limiting computer use to family spaces, but we also know that the best filter comes from being involved with our children. We keep the lines of communication open, and we hope that we're modeling a balanced life for our students. We really don't have "technology discipline." We see no difference between online bullying and on-paper or verbal bullying. We see no difference between damaging tech stuff and damaging any other school property. If we wouldn't take books away from a child who let a book get wet, we won't take contemporary tools away from a child who made a mistake with his or her digital device. For our children, these tools are how they communicate and learn, and if we act as if that's true, the rules become much easier to understand. We moved from three students per computer to 1:1 without any increase in our technology budget. We've done this by choosing devices carefully and negotiating prices. We pay less for robust Windows 8 devices than many schools pay for tablets and Chromebooks. We don't buy service contracts, because our tech staff and our students do the repairs. We don't pay for computer setup, because our student interns image and reimage over 10,000 student computers every summer. We ask parents to donate old smartphones when we need alternate-size devices. And we buy only Microsoft Office and Adobe Creative Suites -- all other software and apps are open source or freeware. Our goal is to spend our technology money on the student, letting us do much more with less. Yes, this is a catchphrase, but it's vitally important. We trust our children, and in turn, they usually do the right things. And this underlies all that we do.